Stinky Bag Tag FAQ's - Big League Stick & Hat Trick FAQ's below! Question: What are the bag tags made of? Answer: Our tags our full color , 2 sided printed on PVC and come complete with 6" loop to attach to your equipment bag. Question: Is there a minimum? Answer: No! You can buy a single tag for $ 5.00 plus shipping and handling. Answer: Shipping costs start from as little as $ 3.99 for all orders shipped within Canada & $ 6.99 for all USA orders. Feel free to upgrade your shipping by courier for an additional charge. For shipping tournament order, shipping is calculated at $ 1.99 per team so a 10 team order would be $ 19.99 for shipping and handling. Question: Do you ship to the US? Answer: Yes! We ship within the 48 Contiguous United States. Question: Can we order for an entire tournament? Answer: You bet! We specialize in tournaments, association & sport camps. Send us your team rosters with team name, player name and jersey numbers and we'll create a custom tag template for each team. Include the team colors and we'll change the jersey color in each locker scene to reflect their team colors! Request a Tournament Quote today. Question: How do we choose jersey color? Answer: When you use our cart check-out you will be given the option to choose one of 50 jersey color combinations. Move you mouse over the laundry room of images to view a larger image of the jersey color combination. Once you have located a jeresy that best matches your team color, click it. If for some reason your team colors are not available, use the text box to describe the color combinations using CMYK colors for referene. Note: Identify "dominate color first ie. White Jersey with blue stripes and appropiate CMYK numbers. Question: How is a tournament order sorted? Answer: We ship tournament orders sorted by team. Each team's order is checked and double-checked for their accuracy. All tags come complete with 6" loop and are bagged separately. Question: What are your tournament prices? Answer: Tournament are our speciality. Send us your tournament numbers and let us know what product(s) you are interested in and we'll email you a Tournament Quote. It's that simple. Question: Can we customize the tags with the team or tournament logo? Answer: You bet! Email us your logo and we'll include the logo in the email proof before production. Ideal file format is jpg, however tiffs, pdf, word documents and publisher is acceptable as well. Question: Are the tags printed on both sides? Answer: Yes. The back of the tag features a contact/owner's information side to the bag tag at no extra cost! We recommend the use of a fine-point permanent marker to print your contact information on the bag tag. If you move or your contact information changes, use a nail polish remover to clean your tag and update your contact information! Question: Can I put a sponsor on the back of the tag? Answer: Sure! Many teams and tournament committees have sponsors pay for the bag tags! Email us or add your sponsor's Business Card to your order using the "Browse" and attach feature on the online order and we'll create the tags with your sponsor's message on the back of the card. Add $ 1.00 per tag order. Question: What is a "Parent/Fan Reference Card?" Answer: For an additional *$ 3.00 each we can ship you a second bag tag (without loop) that your parents/fans can use as a parent reference card to help them identify players with a name to the number! Ideal at the beginning of any season! Question: What are your forms of payment? Answer: Paypal. If you do not have a Paypal account you can enter your Visa or Mastercard through our secured checkout. Question: What is the lead time for production? Answer: We print tags everyday and can always squeeze in a last minute order. Typically tags will be printed within 72 hours of receipt of the order. Ideally, we require 3 weeks notice for tournaments. We understand many teams and tournaments don't receive finalized rosters until closer to the tournament or event. If you know you would like to order the tags for your tournament, please let us know so we can schedule the production time for your event. Couriered US orders take 5-7 days and all orders within Canada take 3-5 days. Answer: We can ship using Canada Post or the US Postal Service. Courier shipping is also available with UPS or Fed-X. (Additional charges for courier shipments). Question: What is Lanyard and Loops Special? Answer: We have offered our Lanyard and Loop special to many Provincial and State Championships. 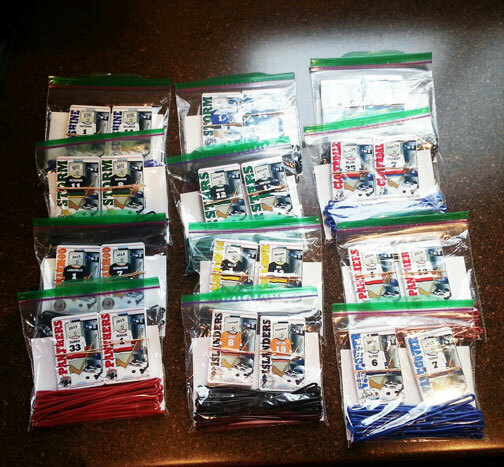 For an additional $ 1.00 per tournament tag order we ship our bag tag orders complete with lanyard and loop so you athletes can use the Stinky Lockers as a Lanyard throughout the Tournament and then convert it with the loop to make it into the bag tag after the event. Many tournaments have dressing room and lockers accessible to the athletes and coaches only. The Stinky Locker Lanyard is a great way to identify your registered players and the loop turns the keepsake into a valuable bag tag after your event. Question: What Sports or Tag Styles do you offer? Answer: We have many types and styles. The most popular of which are listed below. Email us if you don't see your sport or hobby and we will check our archives! Question: How do you apply the sticker? Answer: No special tools are required. The following steps will ensure your Big League Sticker will last the life of your stick! Ensure the stick is clean and dry. Each label is shipped with an alcohol cleaning swab! The stick may also be cleaned with a clean paper towel saturated with isopropyl alcohol (IPA). If using 99% IPA mix it in a ratio of 2 parts water to 1 part IPA. If using rubbing alcohol, do not dilute it. Wipe with a lint free paper towel before the IPA evaporates from the stick. As the paper towel becomes dirty, discard it. A dirty towel does not remove dirt. Make sure the stick is completely dry. Peel the sticker from the backing paper and carefully position one edge along the stick. Use your finger to slowly press the sticker down to the stick, squeezing out any air bubbles that may be present. Once the sticker has been applied, use firm pressure to activate the adhesive. Question: Can I order just one? Answer: Yes. 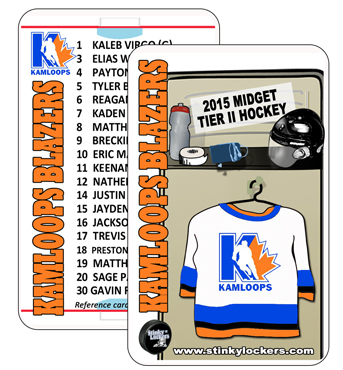 However, many customers want extra labels for their back-up stick, road hockey stick, mini-stick & more! They make a great stocking stuffer and when you order more that 1 the price drops to $ 5 each! Question: I thought we weren't allow to put stickers on our helmet? Question: I though we were not allowed to put stickers on our helmet? Answer: As of 2012, Hockey Canada released a bulletin and Hockey Canada will no longer remove a player's helmet from the play for the application of stickers. Read full bulletin here. All players within Hockey Canada must continue to wear CSA certified hockey helmets and the CSA sticker must remain on the helmet at all times. Answer: Shipping and handling is a flat $ 3.99 to anywhere in Canada or $ 6.99 for orders to the USA. As many labels as you'd like to one ship-to address. Upgrade to courier with tracking $ 15.99 for Canada & R 23.99 for USA (additional fee applies). There are no extra duties for importing to USA. Question: How do we order for an entire tournament? Answer: Complete the online order form complete with roster names of players, along with jersey numbers, team color and the team logo, and that's it! We'll ship you the entire tournament of labels to hand out at your tournament. Each order will be sorted by team making it easy to distribute to individual teams. Each label is shipped with an alcohol cleaning swab! Question: How long does it take to get my order? Answer: We print Big League Stickers every day! Depending on the back-log of production, a typical order will take one week to customize, print, laminate and cut. Most orders will ship between 7-10 days. Question: What if I don't have a team logo? Answer: Not a problem. If you do not submit a logo, by default we will put our "hockey silhouette" in it's place.